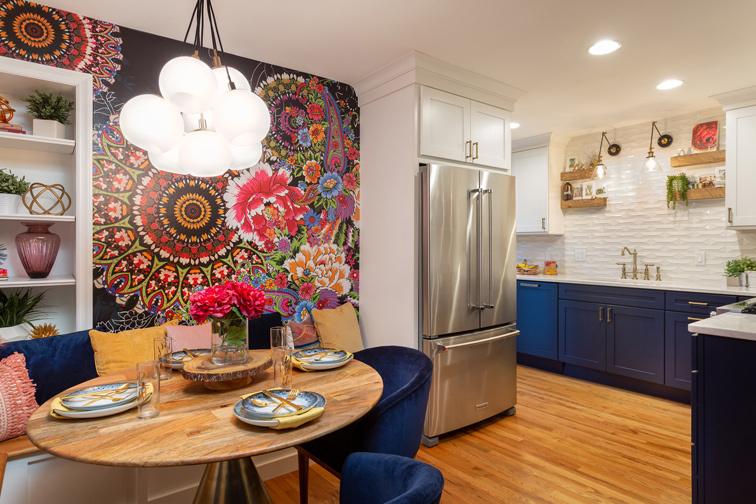 Interior designer Candice Wideman catches the colorful personality of the homeowner in this small and feisty kitchen remodel. They began the renovation by removing the wall between the kitchen and dining room, which had a narrow 36-inch door. 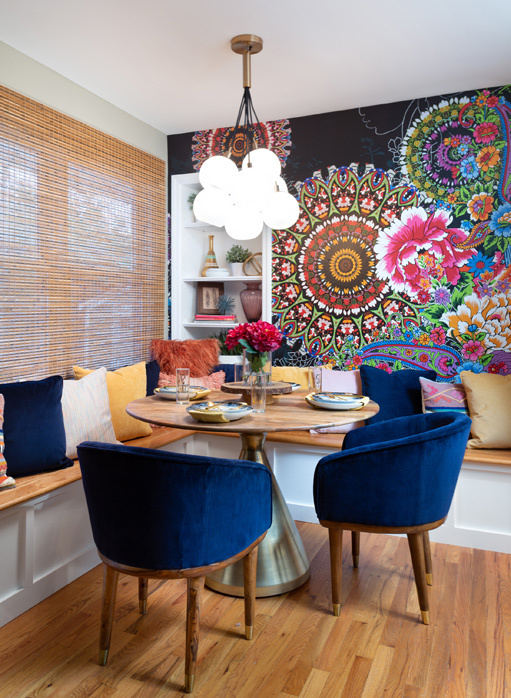 “Having that tiny door between the kitchen and dining room completely cut off one space from the other,” Candice says. 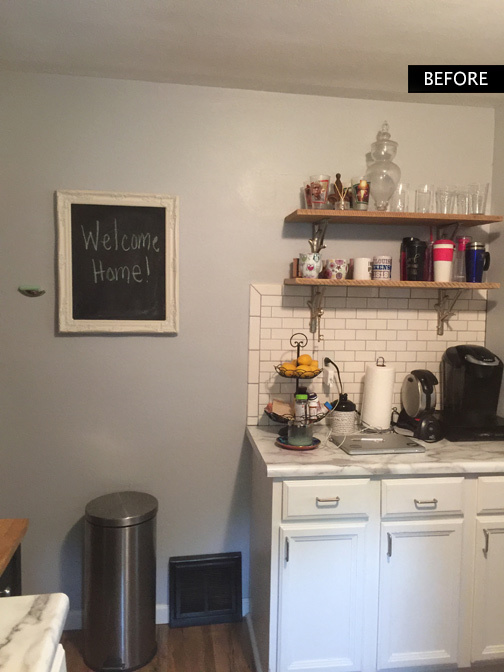 “By removing the entire wall, we were able to connect the two spaces and make entertaining much easier.” Once the wall was removed, red oak hardwood flooring with a matte poly finish was put in the kitchen to match the original flooring in the dining room. Candice and Tiffany worked together to pinpoint Tiffany’s style and bring it to life. Right off the bat, Tiffany knew that she wanted contrasting cabinets and KitchenAid appliances, requests that Candice was happy to oblige. First, the soffits were eliminated to make room for tall white upper cabinets that they paired with navy blue base cabinets from Archway Cabinetry. 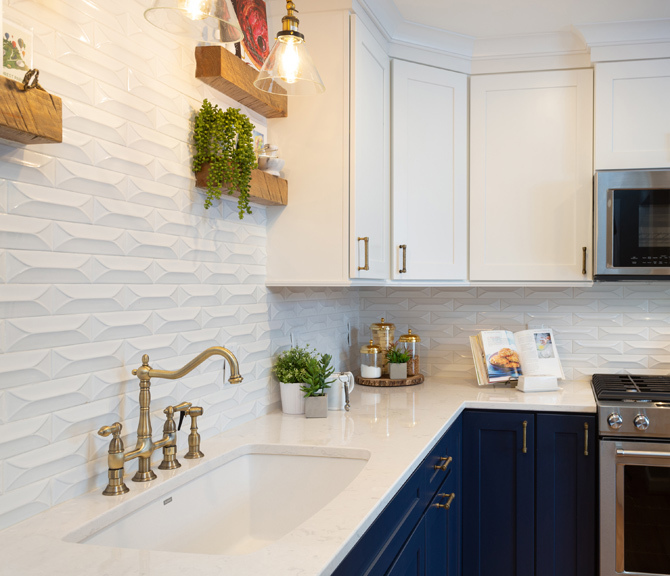 The textured Byzantine Bianco 3D Ceramic Subway Tile that covers the backsplash gives the room depth while not overpowering the bold cabinets. Tiffany wanted custom built-in bench seating in the dining area, but a short closet in the corner seemed to get in the way. Instead of removing the closet and losing much-needed storage space, Candice decided to turn the closet door into a bookshelf. “This new door allowed more space to showcase the client’s décor without having to forgo the storage the interior closet provides,” explains Candice. Now acting as extra storage and cute display, the bookshelf/closet overlooks built-in bench seating covered in the same wood and finish as the flooring. 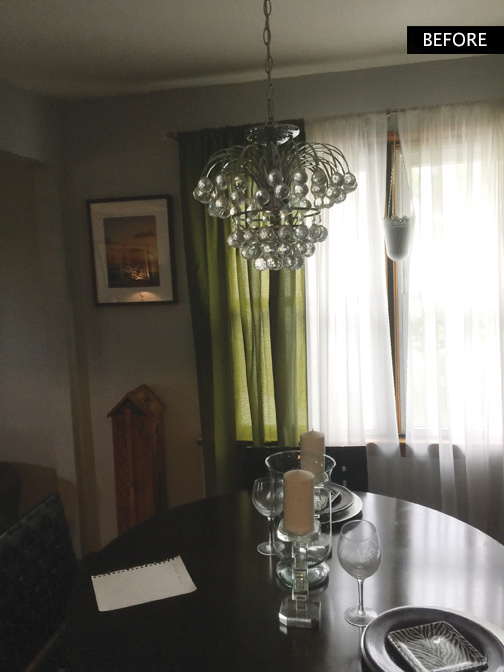 Hanging over the gold dining room table is a simple yet bubbly light fixture that played perfectly into Tiffany’s boho chic style, keeping the room trendy and in sync with the kitchen. Carpet/Wood/Floor Coverings: Berkley Construction Co.